Would like to know if this vase is worth buying. I have my doubts about a bit, there is no stamp or mark, this is the story of the vase by the person who wants to sell it to me. 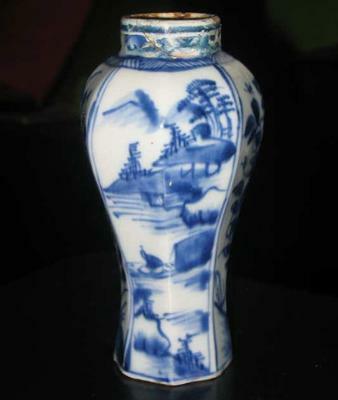 A mid 17th century about 1660 Chinese Ming / Qing vase. The real work is old. Decorated with a scene in four areas with two different sets of figure standing on the waterfront, cottage, floral decoration and mountains in the background and figure kneeling at the waterfront in a similar backdrop. Both images are mirrored to each other. The smooth area between floral decoration. Height about 14.3 cm. 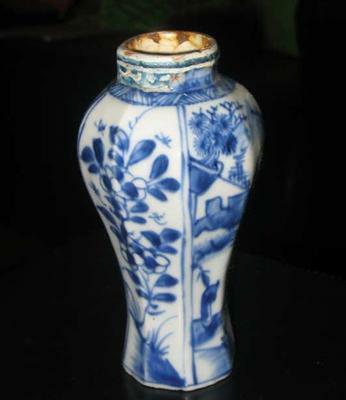 Condition: Old restorations on the shoulder of the vase. For me, this is certainly its charm! Furthermore, small flake base rate - not really noticeable when he stands. No hairlines. Nevertheless, a very nice and especially very old vase in a rare period. 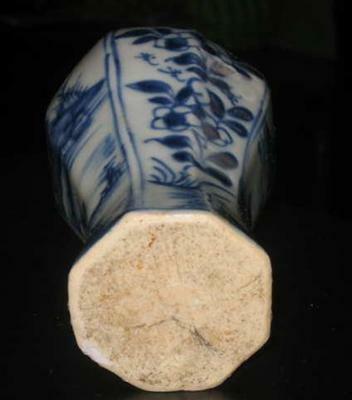 Also recognized as an early 17th century the typical flat bottom. Comments for Advise about this one? I cannot give you a definitive answer, I'm afraid. The color seems to be right. However, I feel uncomfortable with the bottom, but am unable to tell why. The decoration could also be Qing, but if it is Qing, then the bottom is not right. Without hands on I cannot give an opinion on this. If you want to risk it, I wouldn't pay too much for it. Personally, I do not buy when I have this feeling of doubt.